Embarking on a river rafting adventure doesn’t mean you have to give up your caffeine fix. Learn about four ways to make coffee while you’re on the river. Wilderness ethics are an important facet of any outdoor adventure. Learn the “Leave No Trace” concept and other ethical practices to employ during your trip. Rumors of the legendary Sasquatch have become commonplace in the Pacific Northwest. Learn about some tips to help aid in your search for this elusive creature. No matter if you’re relaxing on the lower Skagit or whitewater rafting on the Sauk, there’s plenty of wildlife to see in Washington. Read our blog to learn more. Here in the PNW—land of rivers and untrammeled nature, birthplace of REI, and home of some of the country’s best whitewater—every adventure is unique. There is nowhere else in the world with our outdoor culture and easy access to rainforests, rivers and glaciers, especially just a few miles outside a world-class city like Seattle. This mix makes for river adventures unlike any other. Our whitewater and our locals both have their quirks, but that’s what makes these trips so memorable—you just can’t get this anywhere else. What is the Trails Stewardship Act, and Why Does it Matter? The Trail Stewardship Act addresses a serious trail maintenance problem in the Forest Service with community-based solutions, creating a path for those who love the wilderness accessed through USFS infrastructure to give back to the trails and sites that their adventures rely on. A look into the best campgrounds in the Seattle area. Our river guide staff spends most of our nights of summer sleeping under the stars on the river; here are some of our favorites. On your next overnight camping adventure you won’t be disappointed with one of these great spots. The beloved local rivers of the pacific northwest are some of the most popular places for recreation, for one of the most outdoor centric cities in the US (Seattle). Triad takes a look into the problem of litter in our national parks and forests, as we consider; “what more can we do for the rivers that do so much for us”? Wearing wetsuits on rafting trips is one of the simplest ways that you can protect yourself while whitewater rafting. We take a look into the possibility of cold shock and hypothermia, and explore a common rescue scenario. A look into the scientific proof that spending time camping in the mountains is good for your health and quality of life. The next time you take a whitewater rafting trip with Triad River Tours, make sure to include a night of camping in the Cascade Mountains while on your rafting adventure. Every year rafters on the Skagit and Nooksack Rivers host one of the largest concentrations of bald eagles in the contiguous United States. Throughout 2018, there have been an estimated 700,000 whitewater paddlers in the United States. Some of these rafters have been paddling for decades and some have just begun this tremendously fun and exhilarating hobby. Rafting difficulty ranges from class 1 whitewater rafting to class 5 whitewater rafting. The outdoor recreation industry generates approximately $887 billion in consumer sales each year, but many American families stay put throughout the summer and never do any sort of fun-filled outdoor activities. From river rafting trips to hiking adventures, it’s time to experience the outdoors and have some fun. Why does Triad use Wood Oars on our Rafting Trips? Among professional whitewater rafting guides, there is an age old question (well, at least since composite oars were invented); why would you choose to run wooden oars in whitewater instead of composite? Whitewater rafting is one of the most fun things you and your family can do this summer. Currently, there are about 700,000 white water paddlers across the United States. Whether you're planning on rafting for the first time or have been taking river rafting trips for years, it's important to ensure that you're staying as safe as possible. Our friends at Swiftwater Safety Institute come to the PNW to teach rescue techniques and have a good time. This year we had 3 Hungarians join the crew. Why do we want our guides to have SRT-1 certification? Is river water safe to drink? A look at water safety on whitewater river rafting trips. Looking into our carbon footprint and desire to conserve resources while whitewater rafting. Do I need a rescue PFD? Investigating the necessity of a rescue PFD for whitewater rafting guides. A look into the geology of the Cascade Mountains and the rivers that were formed by them. List of things that should be contained in the pin/sweep/emergency kit for a whitewater rafting trip. What type of oars/paddles should I use in my setup? Taking a look at different materials and brands of whitewater rafting oars and blades. Comparing 15 and 16 foot long self bailing whitewater river rafts on commercial rafting trips. Comparing 14 foot long self bailing whitewater river rafts. Investigating the advantages of safety kayakers and safety catarafts on professionally guided whitewater rafting trips in Washington State. An investigation into smaller, self bailing, whitewater river rafts. The best rafts we have used for R2 on steep whitewater creeks. Why choose Triad for your next rafting trip? 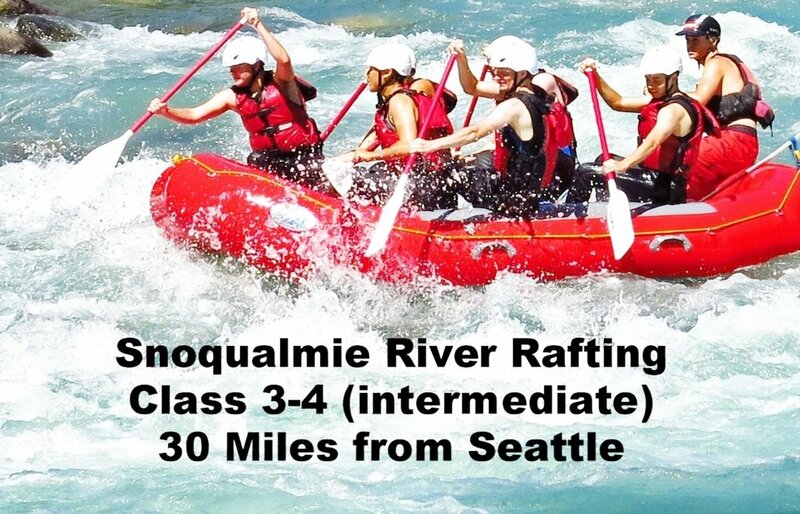 All of our rivers rafting trips in the Seattle area are operated by highly-trained, fairly-compensated career professionals who utilize meticulously crafted, researched, and refined safety systems. Every Triad River Tours lead guide is SRT-1 (Swiftwater Rescue) trained and certified by the Swiftwater Safety Institute and has advanced medical training. All of our medical procedures are researched and refined by our staff EMTs. We spare no expense in making sure our guests are cared for in the best way possible. Our business ethics, environmental sustainability, social justice, and equal opportunity policies represent a deep commitment to being a leader on the river and in business on the part of our company’s leadership. 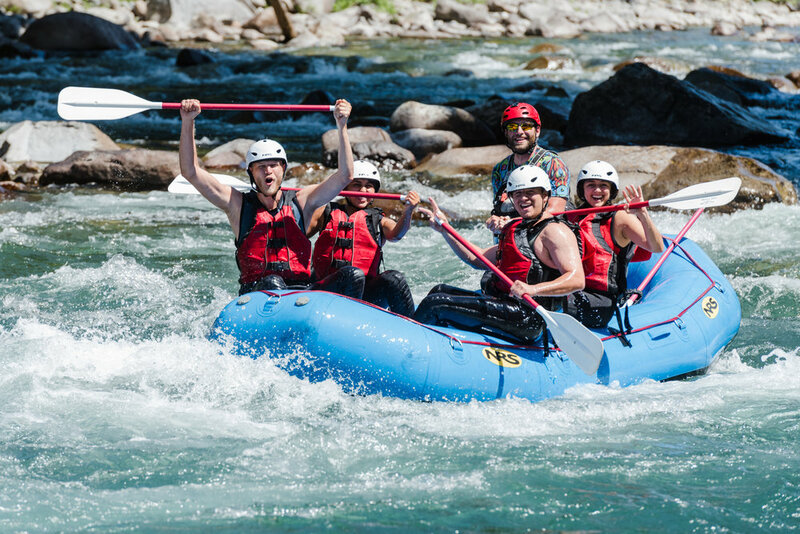 Our white water rafting trips in Washington State are simple and state of the art, featuring the very finest whitewater equipment and techniques. Triad's safety record is unparalleled due to our commitment to investing sustainably into continued research into refinement of our safety protocols, hiring of industry professionals, investments into continual training for our staff, and investing in the finest equipment available in our industry. Triad River Tours is a proud partner of the Swiftwater Safety Institute, a member of the America Outdoors Association, and a member and supporter of American Whitewater. Triad River Tours is a licensed whitewater river rafting outfitter in the State of Washington and holds federal use permits through the United States Forest Service and the National Parks Service. All of our experienced lead guides such as Brandon Steele are Swiftwater Rescue Technicians with life support medical training. Preparation: Triad River Tours was founded by river guides. Our five river managers all have over 10 years of rafting experience; combined they have nearly 100 years as whitewater professionals. Triad is uncompromisingly committed to highly paid industry professionals who are exceptionally qualified to lead minimalist rafting trips. Understanding the connection between a fair/living wage for outdoor professionals and the quality of performance is critical when analyzing our company. While guides don't walk around with dollar signs attached to their helmets, rest assured that our commitment to them as an employer nears a sacred bond. When you get into a raft with a guide that loves the company they work for, is paid fairly, and works in the profession that they love, you've taken the first step towards seeing the difference between our company and our competitors. We believe that our profession starts and ends with quality guides. We know of no other company in Washington who pays their guide staff as well as we do or has standards higher than ours for competence, performance, and experience. Our guides are so highly qualified that they each have input in developing our system; that is why when you go to the river you can so clearly see the difference between our company and "theirs"... Our systems were developed by experienced guides, and they are operated by experienced guides every day. We take thousands of people down the river each year and after each and every trip we debrief the previous one; in addition, every week we meet to see if any aspect of our system can be improved. Over the years our system has become more exacting and more refined, to the point where every facet of our company is distinctly organized and shows our skill at our craft. When you raft with us we want you to feel that you are going with the best; the only way to truly provide that experience is to work relentlessly to provide the finest guides in our industry. Hire experienced river rafting guides whenever possible and pay a fair wage to continue attracting great guides. Require all lead guides and trip leaders to be Certified Swiftwater Rescue Trained (SRT-1). Empower a communicative work environment where younger river guides can learn and improve. Safety: Each year Triad River Tours spends money that many of our competitors do not in order to prepare for all of the elements of chance and danger that the river has to offer us. We work in conjunction with several organizations who support us in our efforts to provide the safest possible trip in an often dangerous setting. We send scouting kayaks out onto the river before trips where river levels have changed, to ensure that the river passage is clear and that our planned routes are accessible. We continually practice our evacuation procedures and communicating with rescue and emergency personnel, and even watch weather and traffic reports to closely predict response times. Each whitewater trip is preceded by an emailed itinerary which includes a safety video, coupled with a detailed safety orientation done at the rivers edge. Triad works in partnership with the Swiftwater Safety Institute and voluntarily invests in independent third party audits of safety protocols, equipment systems, and guide training procedures. If any part of our system--guides, equipment, or operational procedures--is not approved by one of our partners, we remove it. This ensures that at all times you not only have a guide company with the best safety system that they know of, but one that is operating within and above continuously evolving industry standards. We believe in and follow the motto preached by Swiftwater Rescue professionals: "Simple is Smooth and Smooth is Fast". Our safety protocols and procedures are all developed in accordance with the principles taught by leading professionals in the river rescue industry. Washington is one of the most dangerous commercial whitewater states in the USA, with a commercial whitewater fatality reported nearly every year since 2011. When taking into account our state's statistically minuscule market share in comparison to states such as Colorado, Idaho, and West Virginia, the data returns back a clear and unquestionable reality; it is dangerous to raft here. Consequently, as industry professionals in this state we have to ask ourselves a few questions. The first is simple: can this danger be mitigated and/or can the root causes of these fatalities be found out and removed somehow? While it is incredibly difficult (and bold) to state that river accidents are preventable, we firmly believe that many of them are. While neither our system nor our guides are infallible, we must continue to strive to discover what we believe are the primary culprits of river death and work to mitigate them. Utilizing rescue kayakers for scouting runs and (if necessary) additional rescue swimmer support is an aspect of our comprehensive safety system. There is one variable that appears repeatedly when we analyze risk on whitewater rivers, and that is experience. Less experienced guides are more dangerous, and the correlation (r-squared) is high between inexperienced guides and river accidents. As a result, we believe that the best way to keep our guests safe is to retain experienced guides through a fair wage and by operating our guide training at a higher standard than the rest of the industry. In Washington there is no guides and outfitters licensing board for commercial whitewater like there is in many other states, despite the fact that we have challenging and dangerous rivers. When we analyze the state legislation (found here) we find that the standards are loose and often unenforceable. When you take into account the small profit margins that exist in our industry, you can clearly see that these businesses are in a difficult position. In order to put the best guides, best equipment, and finest safety systems in place they will need to spend money that the public will never know about and which adds no perceived value to their trips for the majority of potential customers; in addition, this spending has little to no effect on marketing channel production or sales conversion. This is the beginning of a very vicious cycle for whitewater river outfitters in our state, and because the legislation in Washington is weak or inept, there is very little incentive for outfitters to meet or exceed the quality standards set forth. Triad takes this commitment seriously. If we look into the river rafting safety requirements for guide training in the state of Washington (listed in section 2 of the RCW in the above paragraph), we find that the guidelines are vague at best and provide little support for a public that is often unaware of the risk inherent in running a dangerous river with an inexperienced guide. Confronted with this ambiguity and confusion, rafting companies carry a heavy burden when deciding what it is exactly that is being asked of them. While we applaud the freedom afforded to us by our state legislature to operate within very liberal guidelines, we must take it upon ourselves to pursue industry standards which are not forced upon us in any way. This is one reason why every one of our guides have worked on rivers in other states, and often in other countries. It is also one of the reasons why we consult organizations such as American Whitewater, America Outdoors Association, Swiftwater Safety Institute, and other outfitters, as we must continue to pursue a greater understanding of our responsibilities to the public and to our industry. Unfortunately, it is often the case that these standards are simply thrown out for the sake of driving down fixed costs of operations and increasing profit margins in an industry where there is a "race to the bottom" in terms of price. Rescue Kayakers like World Class Kayak Academy graduate Joshua Larsen (SRT, WFA) are utilized to test river conditions before our guests arrive. Triad trains guides just like anyone else; however, we work hard to ensure that we do so with a high level of commitment and authenticity towards our profession. Professional guides from around the world have taught us how to perform our jobs to the highest level of skill and precision, and we pass this knowledge on to those who train with us as rookie guides. Often times we delay allowing younger guides the opportunity to work for money until we are absolutely sure of their skills; we make them tirelessly perform drills and procedures such as knots, rescue systems, and evacuation routes. Those who are not dedicated to our exacting standards will often prefer to leave our company and join someone else's. It is not hyperbole for us to claim that many of the guide trainees who we rejected now work for our competitors. Our standards for our guides are intentionally very high, and our system is designed to keep these guides working as often as possible, to ensure that we have the finest guides making a living wage while doing what they love and sharing that passion with our guests. Triad utilizes only the highest commercial grade equipment to ensure that trips are never compromised due to a lack of quality gear. Our guides work closely with manufacturers to improve on the design of our equipment, as well as test and refine prototypes and develop gear that is custom built for our application. Having a reputable, experienced guide staff that has traveled the world pursuing their profession gives us an advantage when selecting equipment. Because manufacturers value our opinion, they work tirelessly to ensure that our company is outfitted with only premium gear that will not fail during intense use. Many lower end rafting companies try to squeeze every day, and thus every dollar, from their equipment, often utilizing it beyond it's lifespan. At Triad we make a commitment to purchase only the highest quality equipment, and if that equipment becomes unfit for our needs for any reason we dispose of it; we cannot take the risk of equipment failure while on the river. Failed equipment not only puts our guides and guests at risk of life and limb, it also often becomes litter and degrades the purity of the river corridor; ultimately this destroys the environment which we are out sharing with our guests. Triad refuses to utilize equipment which is below our stringent professional standards. Lead Guide Blake Henderson takes a crew of rafters on the Skykomish through an in depth safety briefing before challenging the rapids of the Sky. Operate only researched safety protocol systems which are continually practiced, refined, and audited by third party experts. Always be up to date on river conditions and if necessary perform a scouting trip prior to commercial operations. Communicate to our guests what our rescue procedures will be and provide a thorough and interactive safety talk. All Triad trips are orchestrated after detailed planning and preparation. It is our goal to provide the greatest possible experience for our guests while mitigating risk and causing minimal impact to the environment. Minimalism: For years rafting was often referred to as the "float and bloat", where outfitting companies would provide table-side lunches equipped with coolers, boxes of bread, and potato chips and soft drinks for everyone. This type of trip has long since run it's course. Statistics in our industry have shown clearly that the safest trip is the one done quickly and efficiently, with the guests and guides focused on successful completion of the route. Adding additional equipment makes rafts less safe by making them heavier, with more hard surfaces (coolers, boxes, frames) for guests to crash into. Furthermore, in the Cascade Mountain Range, hypothermia is perhaps our greatest risk to human safety. Spending more time on land with people sitting around eating sandwiches not only slows blood flow, but utilizes energy needed for paddling and rescue for digestion while guests go down the river. The practice of feeding guests half way down a river section is, for us, reserved only for extended trips, is usually not a part of our itineraries, and often represents a departure from our values of environmental awareness and intimate minimalist nature experiences. The term "leave no trace" is heard often in the outdoor industry, and for rafters that often simply means not to litter on the beaches; but we take this a few steps further. Humans have an odor that can change the behavior of animals that inhabit river corridors. Small bits of food can attract bugs and change the eco-system from the smallest organisms up. Leaving footprints on beaches obscures and tramples over the tracks of wild animals, and the obnoxious formation of "cairns" on the side of the river by humans leaves an otherwise natural landscape changed by human hands. Triad River Tours goes to great effort to ensure that our safety procedures are as ecosystem-friendly as possible while still being effective and fast. In any emergency situation we will not hesitate to pull our trip to the side of the river, hike through the woods, or drive our rescue vehicle through a passable jeep trail, but we do not stop unnecessarily on the side of the river. We believe that the greatest vantage point for witnessing the majesty of nature is from a raft as it glides down the silky waters of the river system. From here we can see and experience the wonder of nature without effectively changing it in any way. As a result, we can run more people down the river while causing less harm to these pristine places so that they can be preserved for generations to come; we strive to ensure that humans who inhabit the earth after we have all passed on can experience the same empowering and spiritually gratifying experience in these wild places as we are able to have now. Always operate trips in areas that have been properly surveyed for environmental impact and teach "leave no trace" ethics to guests. Never leave equipment at the river, utilize rescue kayakers to retrieve any equipment that is used in a rescue. Disallow any potential litter on any raft trip in the form of disposable plastic bottles, candy or energy bar wrappers, etc.